The pivotal game in Group C came alive midway through the second half. ANOTHER SUPERB PERFORMANCE by playmaker James Rodriguez who scored one goal and created the other inspired Colombia to a 2-1 win over Ivory Coast in their World Cup Group C match and to the brink of the last 16 on Thursday. Rodriguez, scoring his second of the tournament, and substitute Juan Fernando Quintero, with his first international goal, struck in the second-half while Gervinho replied with a superb individual goal, his second of the finals, for the African side. Colombia, making their first appearance at the finals since 1998, will qualify for the second round if the match later on Thursday between Japan and Greece ends in a draw or if the Greeks beat the Blue Samurai. Ivory Coast are still firmly in the hunt for a place in the last 16 for the first time in three appearances as they opened with a 2-1 win over Japan. The national anthems saw Ivorian midfielder Die Serey in floods of tears — it was reported later that his father had died hours before the match. The first-half was largely bereft of any excitement, although the Colombians should have gone in one goal to the good but for a dreadful miskick by Teofilo Gutierez after being beautifully teed up by Rodriguez. The Ivory Coast, who had once again opted to leave veteran Didier Drogba on the bench, offered little in attack with their one incident of note a crude piece of play acting by Serge Aurier when having got free of his opponent he then collapsed theatrically to the ground clutching his face. 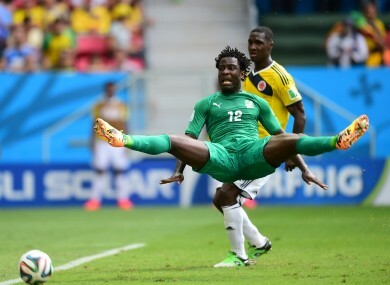 Colombia, though, had done an effective job on taking Ivory Coast’s main creative force Yaya Toure out of the game as Carlos Sanchez followed him everywhere. Toure, though, started to free himself of the shackles in the second-half as first he curled a freekick wide of the post and then produced a delightfully deft chip into the penalty area finding Wilfried Bony. However, the Swansea marksman had mistimed his run and instead of being able to head the ball he was forced to try and do a bicycle kick which flew wide. Colombia swept up the other end of the pitch with Rodriguez finding wing wizard Juan Cuadrado and he worked his magic on the weary Arthur Boka turning him inside and out and his cross shot beat the keeper only to cannon to safety off the crossbar. Ivory Coast coach Jose Pekerman had seen enough and sent on 36-year-old Drogba for Bony hoping he could work his magic with both his previous World Cup goals coming against South American opposition. However, his team-mates were looking at him in askance after the smaller Rodriguez managed to beat him and another defender to Cuadrado’s corner and head home sparking another terrific Motown style Colombian goal celebration. There was another excuse for more of that in the 70th minute as Rodriguez dispossessed Aurier inside his own half and fed Juan Fernando Quintero who ran into the penalty area and slotted the ball past goalkeeper Boubacar Barry. The Ivorians, though, were far from down and out as the match really came to life and Gervinho gave the African side real hope when he scored a superb individual goal. The former Arsenal man picked the ball up on the left flank and then with a swish of his hips beat one man to cut inside and then beat another challenge before tucking the ball past David Ospina. Email “James Rodriguez and Colombia too good for Les Elephants”. Feedback on “James Rodriguez and Colombia too good for Les Elephants”.